ROCKVILLE, Md., 2017-Jun-27 — /Travel PR News/ — Choice Hotels International, Inc. (NYSE: CHH), one of the world’s leading hotel companies, awarded the Comfort Inn & Suites in Branson, Mo., the prestigious Hotel of the Year Award. Chris and Gail Myer along with General Manager Steve Graber received the award on behalf of the hotel team. This is the sixth time overall that the property has achieved this honor. The Hotel of the Year Award recognizes a hotel for its outstanding customer service and operational excellence. Nominees are all top-rated hotels within their hotel brand. You can read about all of the Hotel of the Year winners here. The Myer team has been in the Choice Hotels family since 1992 when they opened the Comfort Inn at Thousand Hills in Branson, Mo. Since then, they have managed Rodeway Inn, Comfort Inn and Quality Inn properties before opening the Comfort Inn & Suites property in 2001. Conveniently located near The Shoppes at Branson Meadows and Sight & Sound Theatre, the 100% smoke-free property features an indoor pool, hot tub, fitness center, free Wi-Fi, ticket service, and complimentary hearty and healthy breakfast. This hotel participates in the award-winning Choice Privileges loyalty rewards program, rated no. 1 in USA Today’s 10 Best Readers’ Choice Awards list. Membership is free, offers fast rewards, instant perks, and exclusive member rates when booking directly at www.choicehotels.com. Members can redeem points towards free nights, airline miles and more while staying at any of Choice’s 11 global brand hotels, including the Ascend Hotel Collection, Cambria Hotels, Comfort Inn, Comfort Suites, Sleep Inn, Quality Inn, Clarion, MainStay Suites, Suburban Extended Stay Hotel, Econo Lodge, and Rodeway Inn. The Comfort brand, franchised by Choice Hotels, has been trusted by travelers and hotel owners for more than 30 years. With a proven track record of reliability, convenience and value, both Comfort Inn and Comfort Suites hotel properties offer everything you need to feel refreshed and ready to take on the day, whether you’re traveling for business or leisure. Comfort is the largest 100 percent smoke-free hotel brand in the North America with more than 1,800 properties open and operating. With a Comfort brand hotel everywhere you need to be, complimentary amenities include a hot, hearty and healthy breakfast, free Wi-Fi, business center, and fitness center or swimming pool at most locations. Rested. Set. Go.® Because behind every great day is a great night. 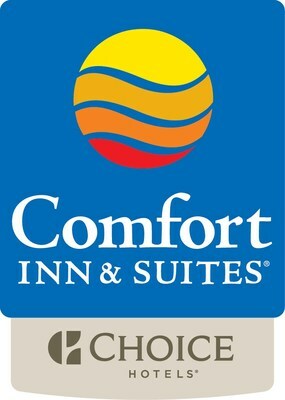 For more information, visit www.choicehotels.com/Comfort-Inn or www.choicehotels.com/Comfort-Suites. Choice Hotels International, Inc. (NYSE: CHH) is one of the world’s largest hotel companies. With approximately 6,500 hotels franchised in more than 40 countries and territories, Choice Hotels International represents more than 500,000 rooms around the globe. As of March 31, 2017, 795 hotels were in our development pipeline. Our company’s Ascend Hotel Collection®, Cambria®, Comfort Inn®, Comfort Suites®, Sleep Inn®, Quality®, Clarion®, MainStay Suites®, Suburban Extended Stay Hotel®, Econo Lodge®, Rodeway Inn®, and Vacation Rentals by Choice Hotels® brands provide a spectrum of lodging choices to meet guests’ needs. With more than 30 million members and counting, our Choice Privileges® rewards program enhances every trip a guest takes, with benefits ranging from instant, every day rewards to exceptional experiences, starting right when they join. All hotels and vacation rentals are independently owned and operated. Visit us at www.choicehotels.com for more information. This entry was posted in Business, Hotels, Travel, Travel Awards, Travel Management, Travelers and tagged Choice Hotels awards Comfort Inn & Suites in Branson, Mo. the Hotel of the Year Award. Bookmark the permalink.